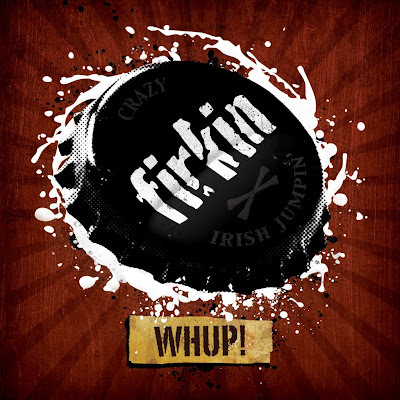 Firkin’s debut album, “Firkinful of Beer”, was one of the best albums released in 2009.Firkin had a new sound, something different from any other band. However, the CD was mainly a traditional songs and Flogging Molly covers album. Then the big questions were if they could keep that high level and write more original songs. 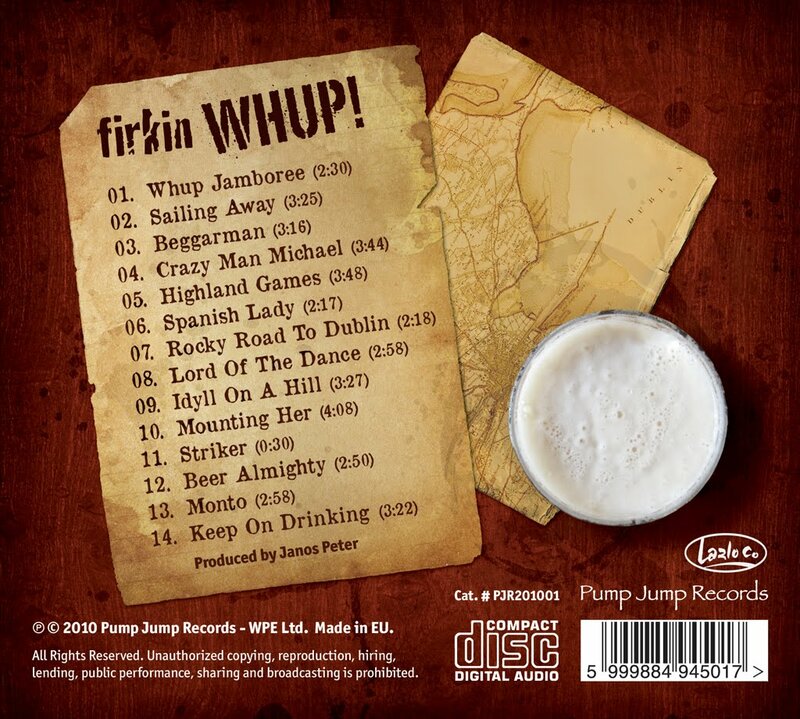 The answers to those questions is “Whup!”, Firkin’s brand new album. What can be heard at “Whup!”? More metal, more flutes, more fiddle and more singer antics. Six excellent self-penned songs and a bunch of traditional and cover songs re-worked by the band. Then, the answers to the previous questions are… Yes, they’ve done it again. The traditional and the cover songs are top-notch and their own material is better than expected. “Whup! Jamboree”, the track that opens the album, a song that proves that Firkin has also a British Folk-Rock side (a wildest Pressgang). A British Folk Rock side? Sure, they have also covered a Fairport Convention’s number ("Crazy Man Michael"). “Beggarman”, a high speed version. Till now my favourite version was that of Great Big Sea, but I will have to think over that. “Lord of the Dance”: great guitar riffs, Peter’s usual highest level flute and that Pachelbel’s Canon clip fiddling. “Monto”. The best traditional cover of “Whup!”. Other bands could play that song in a new way, but they won’t make it better than Firkin. Firkin musicians know exactly were they want to go. So “Whup!” is the logical step in their evolution. The band is growing fast (two albums in two years), they have improved both their sound and their horizons and everybody admits now that they are at the forefront of the European paddypunk scene. This is the last sampler of 2010. Four European bands and one band from the USA. The Pauki (The Spiders) is a Russian band that plays punk rock with some folk influences. Garlic Kings is a new band from Saint Petersburg. Some of the members have played in some well-known Oi! and punk bands. 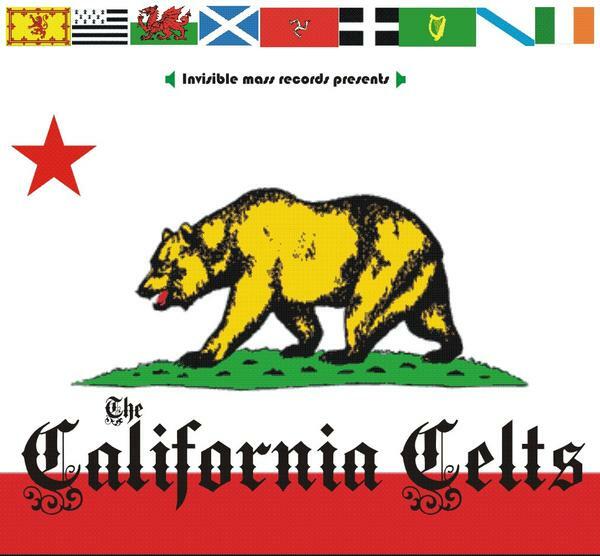 One of the first bands to mix punk and Celtic (Asturian) folk in Spain. They have just released their third album. Bizardunak (The bearded ones) is a Basque band that plays Rebel music influenced by The Dubliners, The Wolfe Tones and The Pogues. Their first album was full of ballads and rebel songs, but the second one has their own material. Most of the tracks are sung in Basque. Happy Ol'McWeasel is a Slovenian Celtic punk band that has released a couple of singles. "The BEST bagpipe rock band I have heard and seen live is RATHKELTAIR.If you have never heard of them,you need too.Neil anderson is an amazing bag piper.They call him the Jimi hendrix of the bag pipes. (...).This band is the best I have found.He is one of the founding members of the group Seven Nations." 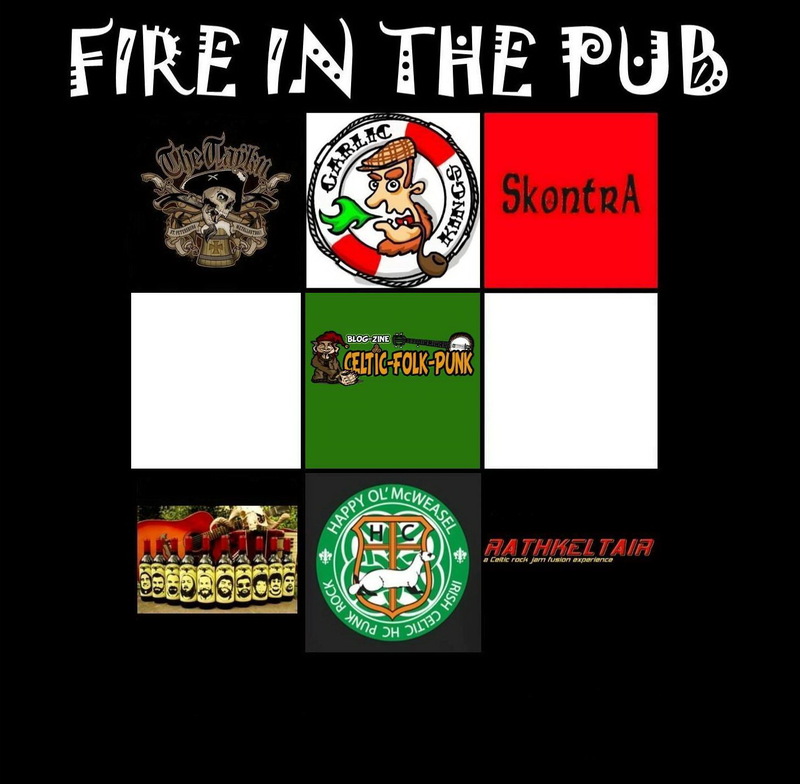 "Rathkeltair (rath-KELT-ur) is one of North America's premier Celtic rock bands. Based in Jacksonville Beach, Florida and touring full-time since 2003, Rathkeltair delivers one of the most energetic, entertaining, audience-friendly shows you will see anywhere. Bringing together three formidable multi-instrumentalists from Ireland, England and America, Rathkeltair combines a rare ability to play authentic Celtic music to the highest standards with a pop sensibility that makes their music completely accessible to all ages. Voted Best Celtic Rock Band of 2006 in the Celtic MP3 Music Magazine Annual Audience Poll, Rathkeltair has been featured at many of the biggest and best-known Celtic Festivals in North America including the Dublin Irish Festival (Dublin, OH), New Hampshire Highland Games (Loon Mountain, NH), Long's Peak Scottish-Irish Highland Festival (Estes Park, CO), the Celtic Fling (Manheim, PA), and are regularly featured artists at events produced by East of the Hebrides, one of the oldest and most respected Celtic promoters in the United States. Available as an acoustic power trio, or a full-blown electric quartet (w/ bassist) or quintet (bassist and fiddler), Rathkeltair can easily tailor a show to any size or type of venue. No matter which version they bring, high energy and extraordinary musicianship are standard features! Every Rathkeltair performance is a stand-alone, unique, must-see event. As thousands of festival-goers will tell you, Rathkeltair always delivers, and never disappoints!" 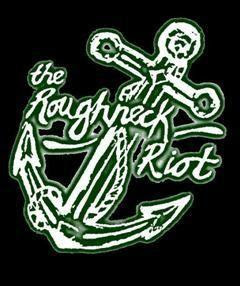 January 2011 featured band is The Roughneck Riot. At the left you will find the Reverbnation widget. The Roughneck Riot - Across the U.S.A. The English sextet consisting of Caitlin Costello (banjo), Jade Franklin (accordion), Matty Humphries (mandolin and Lead vocals), Simon Cowley (drums), Ryan Taylor (bass, vocals) and Chris Green (lead guitar, vocals) has released a 10 track album full of self-penned songs, a risk that not many bands are ready to take. With that classic Pogues-ish line-up (even if no tin whistle is played on the album), it is not strange that The Roughneck Riot sound reminds that of The Pogues and The Mahones. However, when the album is listened several times, other interesting elements come to light, particularly the lyrics, a universe with merges both Pogues’ and The Men They Couldn’t Hang’s worlds. Track no. 2, “Ghosts of the Bay”, sounds as if The Dreadnoughts were singing a song written by Shane MacGowan. Good stuff. It’s followed by “Early Morning, Broken Glass”, which is the most “Mahones” song in the album. But for me the most interesting material comes after these three tracks because the influences are not so obvious: “Mutiny”, the best song together with “Gamblin’ Days”, a top-notch song with a great sailor lyrics. This song could have been included in TMTCH “Waiting for Bonaparte” or “Silver Town” and this would be a folk-punk classic now. I’m happy that The Roughneck Riot has written it. 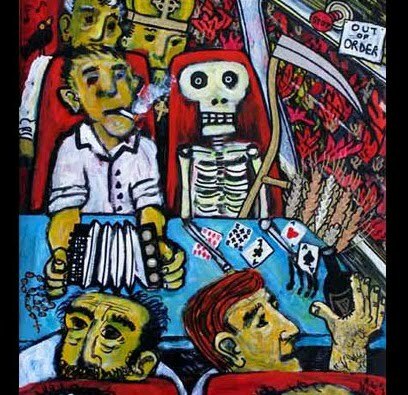 “Need I Remind You Boys That You’re in Hell” has also The Roughneck Riot’s stamp on it: a well balanced mix of accordion, mandolin and banjo and good lyrics. Track no. 6, “Gamblin’ Days” is my favourite track, a song whose level is similar to the best Killigans and Tossers songs. A line of the songs says: “better make and end to those gambling days”. I hope that the boys don’t make and end to this kind of songs and more “Gambling Days” can be heard in their future albums. The next number “Running on Empty” makes you think of The Waterboys at their quietest moments, but then the accordion takes control of the song and it goes in a different direction. Track no. 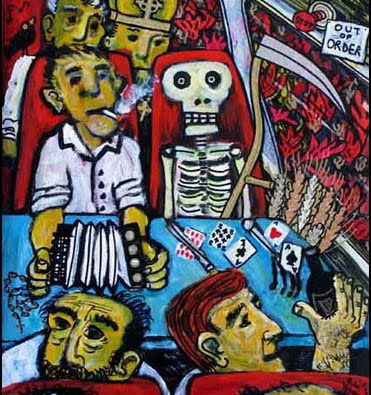 8 is another strong track, “Downing the Days”, a song inspired by The Pogues “Hell’s Ditch” album. “Travellin’ Man” shows a different side of the band, an REM sounding song. And the album ends with another superb song, “Banished”, another sample of The Roughneck Riot's personality. 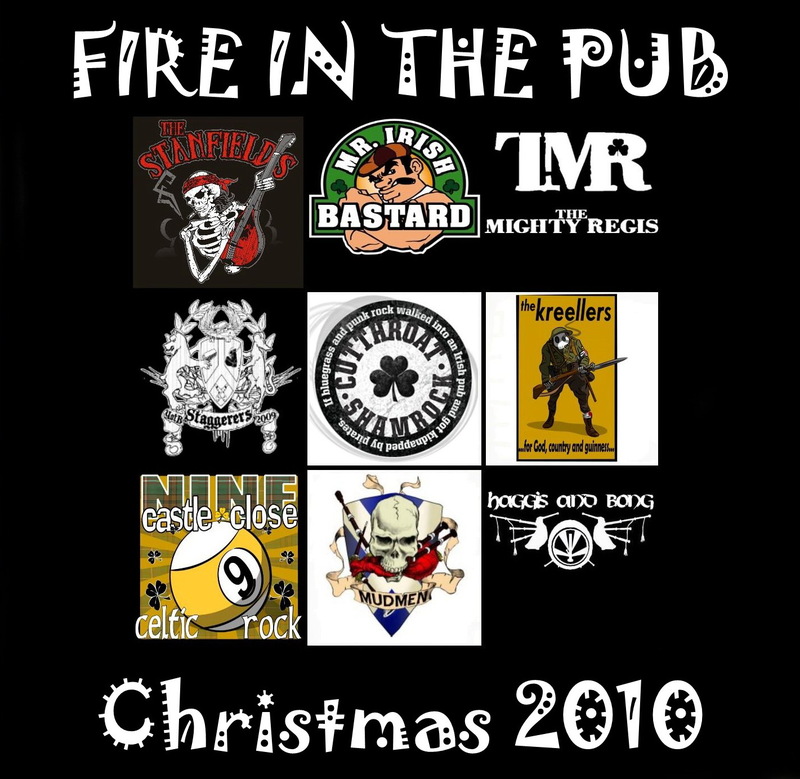 The Roughneck Riot “Night Train with The Reaper” fills the gap that Neck and BibleCode Sundays have left: it is the bridge that connects the Celtic punk made in the British Isles with the one that is made on the other side of the Atlantic Ocean. This is not the December sampler, it will be uploaded in a few days. 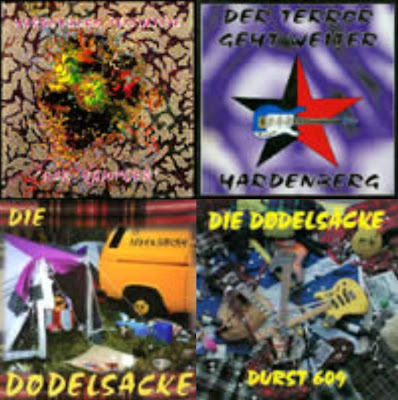 This one collects several isolated tracks that were available as free downloads. 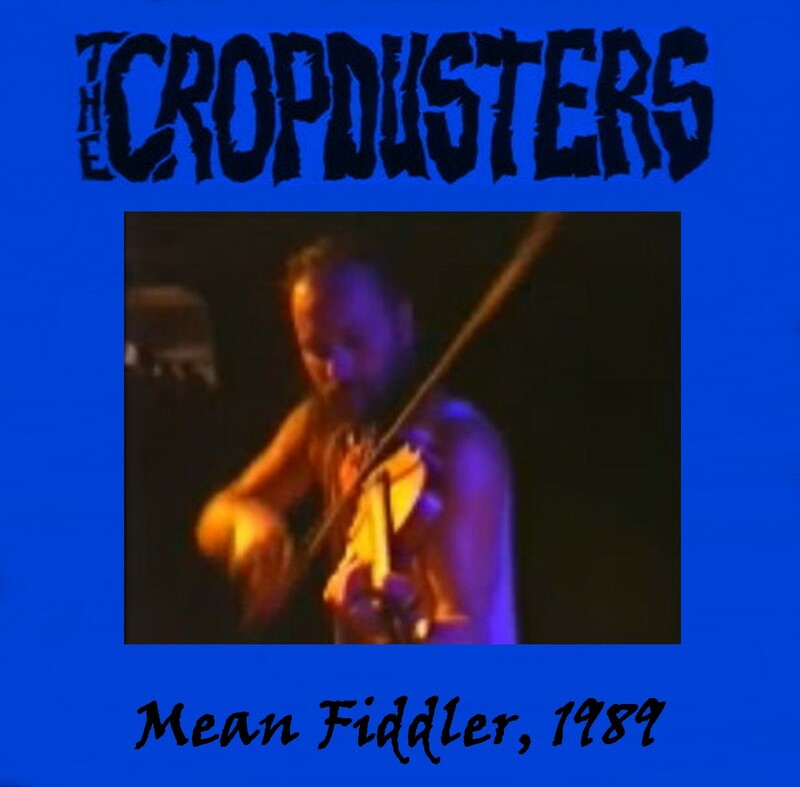 This ROIO was recorded at The Mean Fiddler in Harlesden, London. Enjoy! 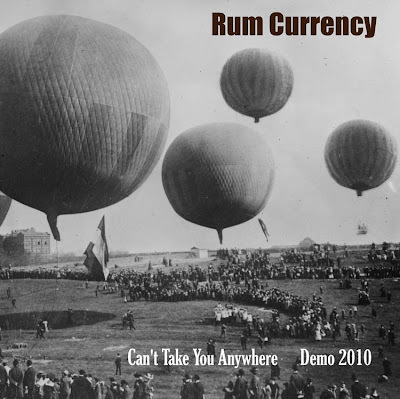 RUM CURRENCY - Can't Take You Anywhere (Demo 2010) Out! "It's WAY too hot in the tropics to record the last few tracks so I'm putting an end to the misery of this one. It took at least two years longer than I planned to put together and has given me the shits no end. Here it is, Can't Take You Anywhere, donate five or ten bucks if you think it's worth it OR spend 1000 days in Sodom you tight arses. Donate so I can afford to buy more gear to keep recording substandard folk music! This work is licensed under a Creative Commons Attribution NonCommercial-NoDerivs 3.0. http://creativecommons.org/licenses/by-nc-nd/3.0/"
Die Dödelsäcke, the German band from the Ruhrgebiet was established in 1989. A lot of tracks are available at their website. plus several tracks from other samplers. The biggest surprise of the year! I had heard Die Dødelsäcke´s previous albums (“Durst 609”, 2002 and “Herrengedeck”, 2006) and I could not imagine that the follow-up would be so good. 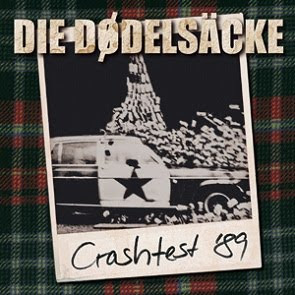 In fact, I have included “Crashtest’89” in my 2010 Top Ten list. Die Dødelsäcke have done it, mixing The Real McKenzies and Die Toten Hosen they have got their own blend. Maybe “Crashtest’89” is not a Single Malt, but it’s a great Blend. 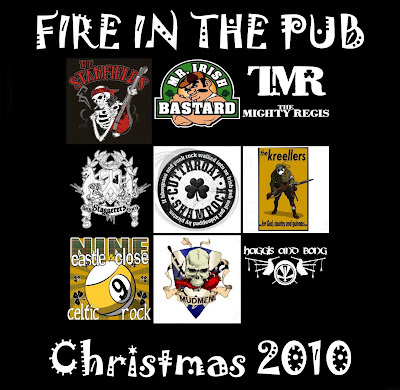 The album begins with Intro, a bagpipe tune played in the traditional style which is linked to the next track, 20 Jahre Kaperfahrt, a song whose Real McKenzies influences are quite obvious. The following number, Opa Kneipen starts with a shout, an excellent catchy punk song with tin whistle and pirate/drunken vocals in Die Toten Hosen style. One of my favourite tracks. Ode and den Spass is a song whose music is that of The Rising of the Moon and Pub Girl’s music is that of I’ll Tell Me Ma. The lyrics are quite funny, a Boy meets Girl at the Pub, they spend the night together and when the boy wakes up he is really astonished when he sees what the girl is. Theodor is another pipes song, whose music is traditional, that I have really enjoyed. The next song is Das ist Punk. The style is not Celtic, but American: banjo, harmonica. A Johnny Cash song that turns into a punk one. Rentner is another punk song that shines: a mandolin-driven song with Die Toten Hosen and Peter and The Test Tube Babies influences about the life of the people who got their retirement. 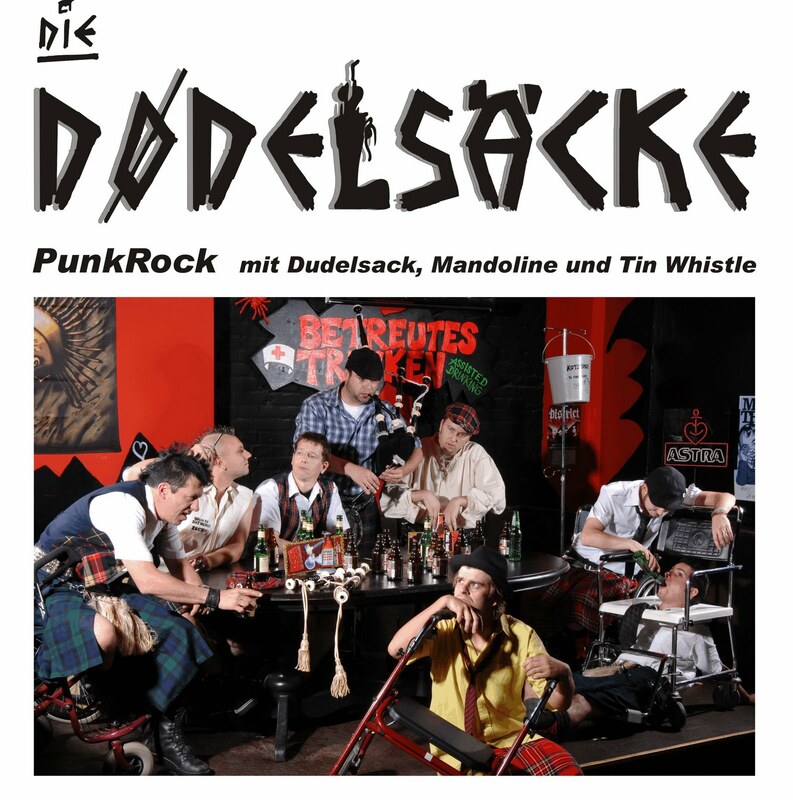 Das Gegenteil is a German style punk, a fast song with tin whistle. Zwei Wege, great bagpipes punk similar to Bastards on Parade. Imagine this was sung in English, it would be a classic of the genre. Pub Boy. Do you remember Pub Girl? This is the girl’s vision. Excellent mandolin and guitars in a song that could be included in any Toy Dolls or MaccLads album. Zu Spät (Too Late) is a quiet tin whistle song in which the pipes burst at the end. Ah, and the CD design is high quality: a 12 pages booklet, a band's sticker and a couple of dice inside the jewel case. Which is the best Bagpipes rock band in the USA? 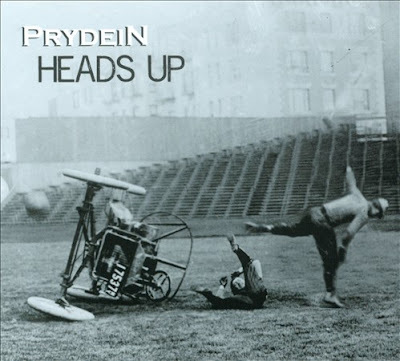 Maybe Prydein, the band from Vermont which has released their third album in 2010, “Heads Up”. After “Loud Pipes Saves Lives”, this is an excellent come back. Prydein consists of four great musicians, Aron Garceau (vocals, guitar, mandolin and keyboards), Iain MacHarg (bagpipes, pennywhistle), Andy Smith (bass) and Caleb Bronz (drums). The band is really tight and all of them shine, because all the instruments are integrated in the best possible way. The selection of the tunes, the arrangements and the structure of the set of tunes are perfect, at least I am not able to say that a tune in the middle sounds out of place. 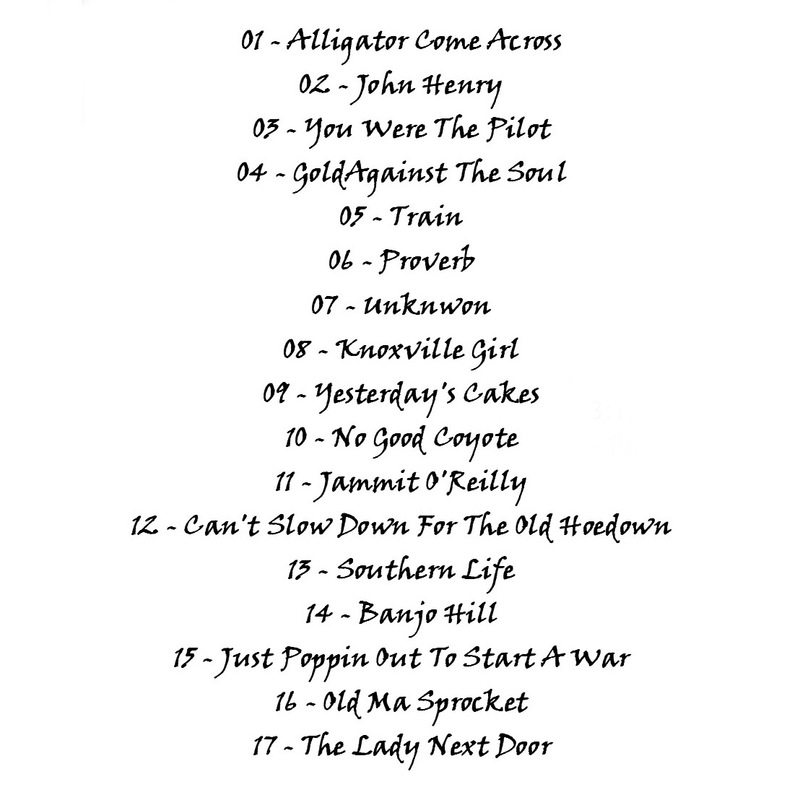 Most of the tracks are still instrumentals, but there are several songs, a couple of standards, Loch Lomond and Whiskey You’re the Devil, a J.Geils Band Centerfold cover and an original whose lyrics were found in the February 1913 edition of “The Vermonteer”. 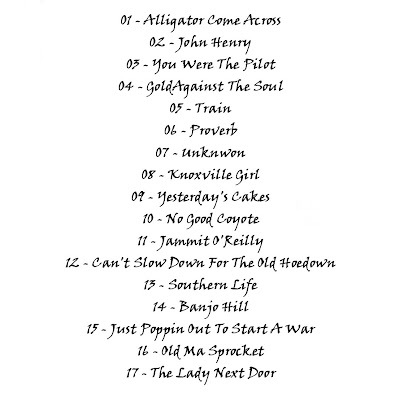 OK, there are some short lines on tracks such as Devil’s in the Kitchen and Feelin’ Alright, but they are mainly set of tunes. The track that opens the album is Devil’s in the Kitchen and after having heard it, you want more. The next number is Loch Lomond. A good version. Track no. 3 is Thymes Changes, a set of tunes that features a Jig from Galicia (Spain). Centerfold, the J.Geils Band cover gets the Prydein treatment. The Drunken Piper is another set of tunes that shows you why Prydein are at the top of the Bagpipes Rock bands. The music from track no. 6, Longing for the Homeland, has been written by Aron Garceau, who is a Led Zeppelin fan. However, IMHO, it is not as interesting as other tracks. The following track is ¼ Short. Three tunes from different pipers, PM J.MacLeod, PM William Robb and Prydein’s own piper Iain MacHarg. As I have said previously these guys know how to choose the best tunes and how to arrange them. The standard Whiskey You’re the Devil is always a sure bet. In this song Iain plays the tin whistle instead of the pipes. Track no. 9 follows the path opened by track 7, another excellent selection of tunes written by different pipers and Iain. It is followed by a Set of Breton Tunes. If Thymes Changes featured a Galician Jig, Breton Tunes is a set of tunes from Brittany (France), another Celtic land. Feelin’ Alright, a funky number, features the tunes Green Wood Side and Drowsy Maggie. A versatile band who plays music from different origins and from different genres. And the last track is The Big Apple Heist. Who is the best Bagpipes Rock band in the USA? Just listen to this track and you will need no answer. “Heads Up” is an album that should be in your collection. The digipack packaging contains all the information you need, liner notes, credits, thanks and to whom the album is dedicated. Apart from that, the band keeps on joking about where the album was made and where you should file the album. Those who bought “Loud Pipes Saves Lives” know what I mean. I expect that Prydein are able to write some catchy songs in the Wolfstone (Ivan Drever’s Years) or MacKeel vein. A better balance between excellent tunes and self-penned songs will help them to get the massive recognition they deserve.